Shurden on Baptists: Assessments, Appreciations, Apologies contains articles, essays, and speeches given by Walter Shurden on Baptists. 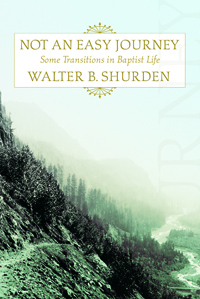 Walter Shurden is a longtime champion of the role of freedom in the Baptist tradition. Recognizing that freedom alone is not the whole story, Shurden also speaks to and from other cardinal Baptist convictions. Some of the materials in this volume appear for the first time and consist of speeches and addresses that Shurden has made at crucial points in recent Baptist life in America in the latter part of the twentieth century. Especially concerned with the fundamentalist takeover of the Southern Baptist Convention and the resulting lack of emphasis on historic Baptist principles, Shurden addresses directly and indirectly the SBC controversy in several of the chapters of this book. Moreover, Shurden emphasizes what makes Baptists distinctive in American religious life.